There are many web programming languages that you can use to create a website. All languages have their advantages and disadvantages. In more cases, it is the web developer himself that can take whatever language and create a great website. 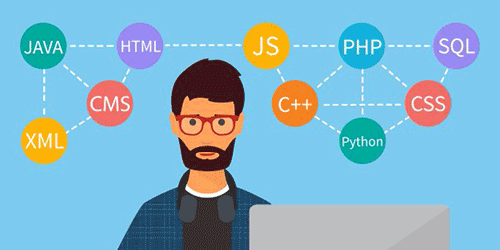 Which web programming languages should I use? As there are some languages that are a must, such as HTML and CSS. There are some others that you should be aware of and know some basic functions to be ready for any type of project. HTML is the standard markup language for creating web pages. It is the standard and building blocks for anything web related. Most developers start here and work their way up to the more complex languages. There is no way around it if you are creating web pages. You must learn this code. There have been upgrades to the current markup. The most recent and major update was HTML5. The biggest update is the support of video and audio. Which has replaced the third party plug-in Flash. CSS, or Cascading Style Sheets, is one of the most useful languages to learn. Highly recommended! CSS can set and control all your visual design elements. HTML and CSS go hand in hand together. One CSS document can control design element to several other documents. This makes your pages 100% flexible. Responsive design is a term that directly referring to CSS. Responsive design is a way to dynamically change your website's layout depending on the device's resolution. This is focused on the mobile industry. PHP is a server-side programming language. It processes the code on the server, rather than the client side. This could be helpful to store data or process code that shouldn't be seen by others. PHP is an open source language that is operated on a Windows or Linux OS. Most common environments for PHP is a LAMP. This is a software bundle that includes Linux OS, Apache server, MySQL database, and PHP coding. PHP can link to a variety of databases like MySQL, Informix, Oracle, and Sybase. The most common type is MySQL. There are a lot of content management systems that are developed in PHP. Knowing this language, you can customize some of those applications. MySQL is an open source database application that will run on a Windows or Linux OS. It focuses on using Queries to insert, modify, delete and select database information. You need have a coding language to call these queries from a web interface, usually PHP. PHP uses scripts to call these different queries and display information to the web user. This is a framework, rather than a programming language. But with its increase in popularity, I would like to mention it. Ruby on Rails is a web application framework, referred as Rails. Like most coding frameworks it has a file architect that you must follow. Using Rails you can create clean code that takes less time. It has plug-ins to eliminate consuming tasks that come with all websites. Such as database connections, inputs, and storage. These are some of the most used web programming languages used today. Some might work better than others and you might never use them on your page. If your site continues to grow and increases with traffic. These development coding languages can come in handy. Knowing different languages and knowing what they can do can make your job easier. I only know basic HTML. But I really want to learn programming languages. I think if you really want to invest and planning to use your programming skill as a living, then go for html/css and Php, these languages are the most commonly used by lots of websites especially web 2.0 sites.